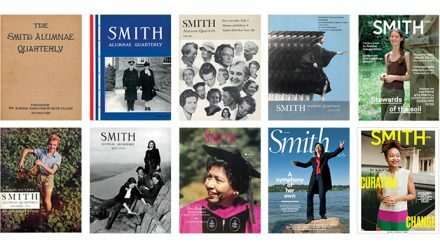 A new digital archive offers a searchable path to Smith Alumnae Quarterly content dating from the very first issue, published in 1909. The comprehensive archive takes the place of the limited, PDF-based online flipbook, in which readers could see the magazine online but couldn’t search across issues. Piles of much-needed winter clothing, collected by Smith students, will be distributed to 51 refugees soon arriving in Northampton from Syria, Iraq and Burundi. 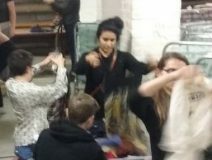 “The experience was the epitome of ... the way students connect with the community,” said Beverly Lipsey ’18J. Charlotte Samuels ’20, Eliza Cummings ’17 and Abby Bergman ’18, all pictured above, have completed record-breaking distance swims, adding to Smith’s marathon swimming empire. Find out why Smith students and alumnae are owning the sport. Chelsea Williams ’13 reflects on her mentor relationship with Paula Giddings, Elizabeth A. Woodson 1922 Professor of Africana Studies. 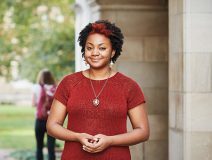 Williams, currently a student at Washington University in St. Louis, says, "Once you make the connection, it never breaks for her—she goes out of her way to help." Jessica Nicoll ’83, director and chief curator of the Museum of Art, will lead a weekend getaway for art lovers at the museum, March 24–25. The focus will be on the exhibition Leisure & Luxury in the Age of Nero: The Villas of Oplontis Near Pompeii. The program includes a lecture, lunch and panel discussion with members of the international team of scholars who created the exhibition. Overnight accommodations included. Register today. New honors, awards, books, plays and films are among the recent accomplishments of Smith students, faculty, staff and alumnae. Read about them in the latest People News. As a young couple, emeritus professors Helen Lefkowitz Horowitz and Daniel Horowitz spent a summer camping in Italy and France. One place they didn't visit was Provence. In her new book, A Taste for Provence, Helen traces how and why this once-overlooked region has captured the romantic imaginations of the traveling public.